Filled peppers feel a bit like a blast from the past, the 90’s in particular, but they are actually really good. 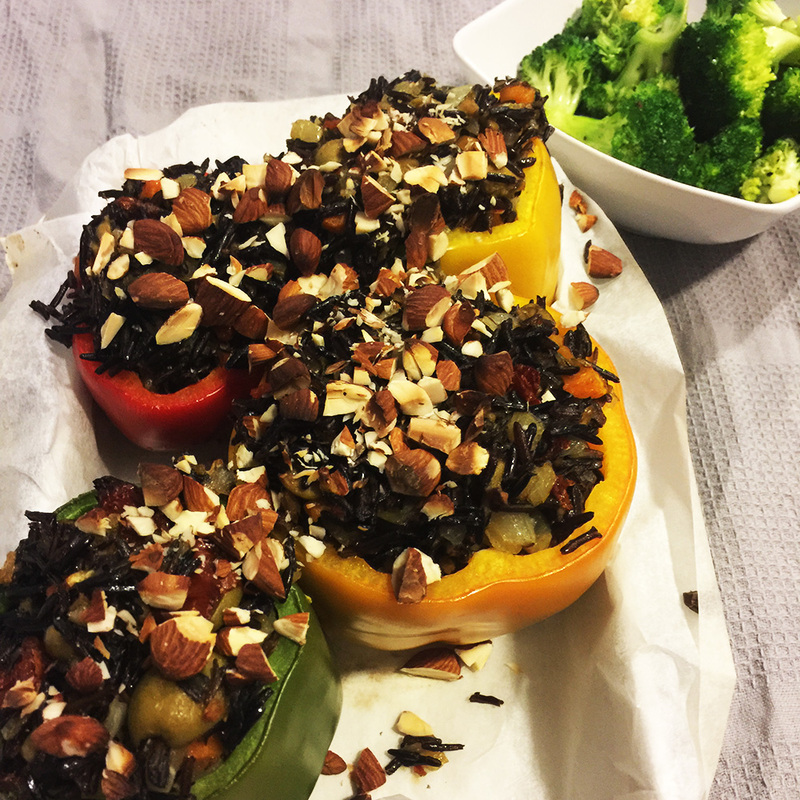 The sweetness of the peppers goes great with the nutty flavour of the black wild rice. 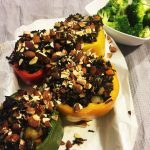 The filling gets really hearty due to the black wild rice texture but still has a low GI. Hurray! The pan-fried broccoli that comes with it gives it a buttery break in taste and also provide iron and vitamins. The wild black rice takes some time to cook, but the wait is well worth it! Add the black rice and water together with some salt into a saucepan and bring to a boil. Lower the heat, cover loosely and boil for 45 minutes – 1 hour. While the rice is cooking, mince the onion and carrot nicely. Grease up a frying pan and fry together until the onion is translucent. Set aside on a plate. Mince the olives and sun-dried tomatoes and mix together with the onion and carrot. Cut the top of the peppers and remove the seedcase. Line an oven-proof form with non-stick paper and place the peppers inside. 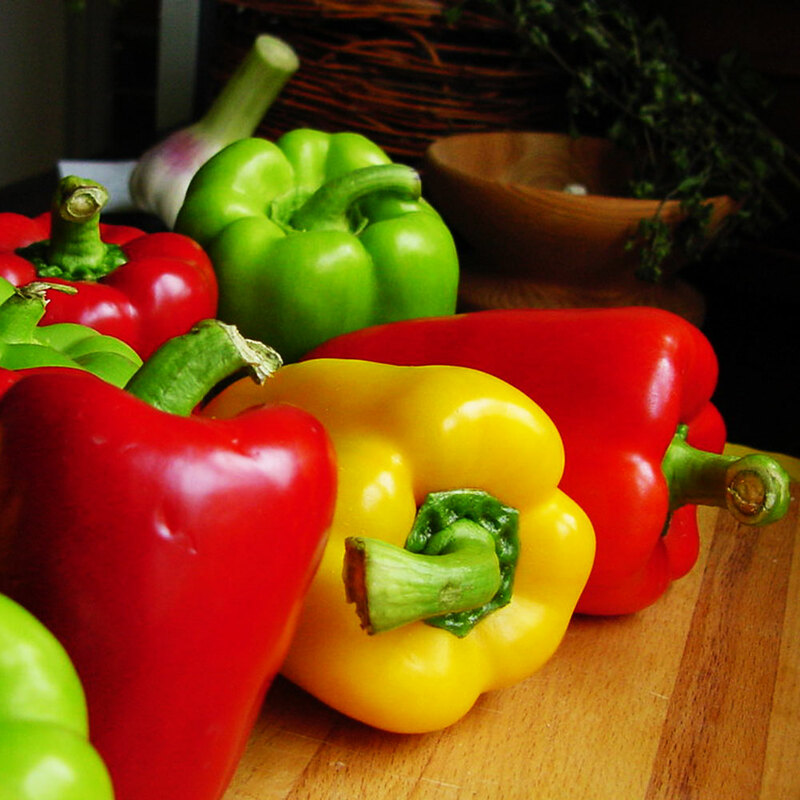 Try to make the peppers “lean” against each other if you have trouble making them stand. When the rice is ready, rinse out excess water (if any) in a strainer. Mix the rice together with the onion mix and taste with salt and pepper. Take a spoon and fill each pepper to the brim with the rice mix. Sprinkle some almonds on top and put in the oven for 20 minutes. When waiting for the peppers break the broccoli into florets and fry them in a greased frying pan. Lower the heat immediately if burning. Fry for 5 minutes (or longer if you want them softer). Serve the filled peppers with the pan-fried broccoli together on a plate.